This is it, the actual recipe! The one holiday tradition that has kept pace with my family, no matter how much change during the year, is Wreath Cookies. 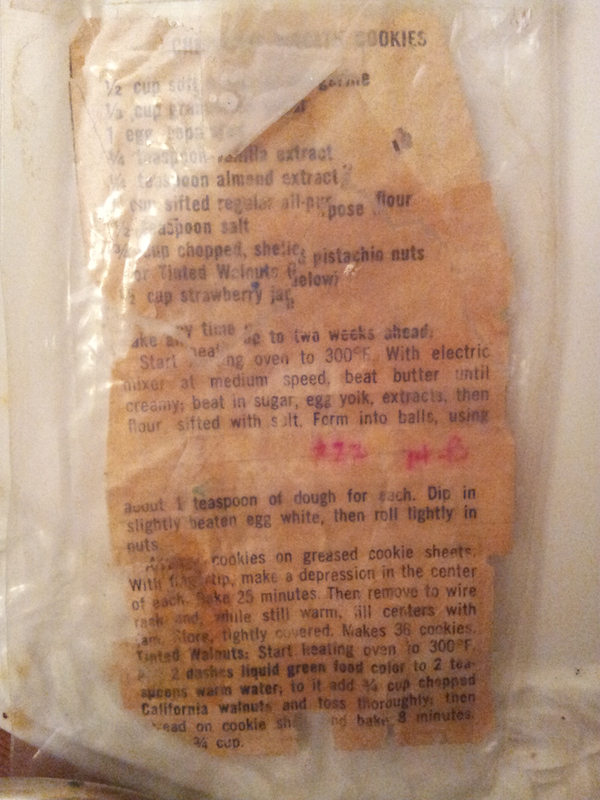 The recipe, now a worn, taped, yellowed piece of paper, was cut out of a magazine by my mother over 50 years ago (that couldn’t sound and look more strange–50 years!!) Every year on a Sunday afternoon in December, my Mom would make wreath cookies …the day we would decorate our Christmas tree. The smell of the cookies baking was enough to make your mouth water; even the batter, the smell of real butter mixed with almond and vanilla extracts; O.M.G. Around 1988 I took the original piece of paper and placed it in a tiny sleeve of plastic so that I wouldn’t injure it any further. 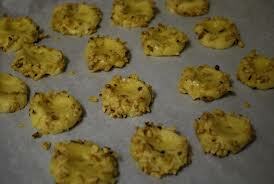 It was then I became the “keeper of the recipe”, and as a result am expected to make those cookies every year. I will pass on that responsibility to someone else some day; but for now I enjoy doing it every year. After all, it’s not Christmas until we eat wreath cookies! So, thanks, MOM, for cutting out the recipe and keeping the tiny piece of paper stuck in your Fannie Farmer Cookbook all those years! Here is the recipe and in order to make enough a large group like my family, my Mom would quadruple it! Make any time up to two weeks ahead, keep refrigerated. Preheat oven to 300º. With an electric mixer at medium speed, beat butter until creamy; beat in sugar, egg yolk, extracts, then flour sifted with salt. 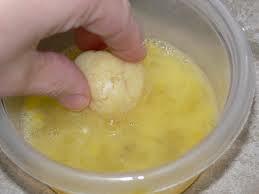 Form into balls, using about 1 teaspoon of dough for each. Dip in slightly bean egg white, then roll lightly in nuts. Arrange cookies on greased cookie sheets. With fingertip make a depression in the center of each. Bake 25 minutes. Then remove to wire rack, and while still warm, fill centers with the jam. Store tightly covered. Makes about 36 cookies. Tinted walnuts: Start heating oven to 300º. Add 2 dashes liquid green food color to 2 teaspoons warm water; to it add 3/4 cups chopped walnuts and toss thoroughly; the spread on cookie sheet and bake 8 minutes.